Nantucket is a 50-square mile island of incredible natural beauty and unspoiled historic charm, situated 30 miles out to sea south of Cape Cod. The charm of Nantucket is embodied in its well-preserved architecture and its protected moors, plains and beaches. For more than 150 years Nantucket served as the center of the world's whaling industry. In recognition of this heritage, the U.S. Department of the Interior designated the town a National Historic Landmark in 1966. 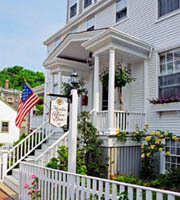 The Nantucket economy is based upon tourism and second-home development. Connected to Hyannis by two ferry services and several airlines, the island summer population peaks at approximately 40,000 in August. Residents and visitors alike enjoy Nantucket's many bike paths and beaches, as well as seasonal events including the Daffodil Weekend, Harborfest and the Cranberry Festival. Nantucket's special environment is well-cared for by the efforts of several environmental and planning organizations, including the Nantucket Planning and Economic Development Commission, Nantucket Conservation Foundation (owner of 8200 acres of island open space) and the Nantucket Land Council. The Nantucket Land Bank was founded in 1984 as the nation's first local land trust; utilizing funding from a local real estate transaction fee, the Land Bank has purchased over 1000 acres of open space to date. Built in 1803 by a sea captain for his bride and recently restored to a gracious old-world elegance, this Nantucket inn combines the charm and romance of a bygone era with all the comforts of home. With it's many comfortable gathering areas, its fireplaces, the luxury of it's rooms, it's peaceful veranda caressed by light breezes and the sound of classical music, and of course its spacious roof walk offering panoramic views of the town and the harbor, the Martin House Inn on Nantucket is a place that beckons you to return.